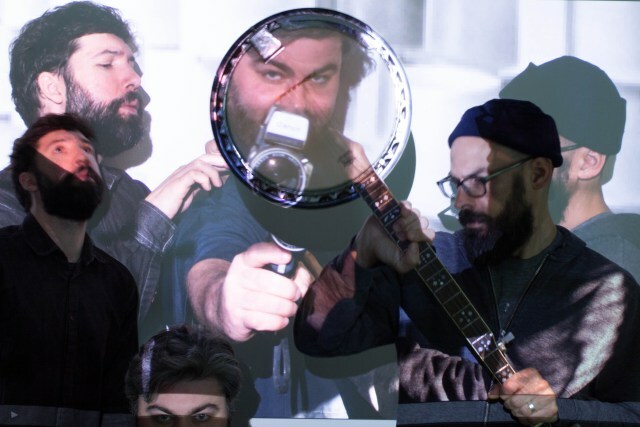 Track x Track: 4a Stables - "Bugboy"
How successful Mr. Gillis was in that endeavor is up for debate, but it is certainly an apt sentiment when examining Bugboy, the debut LP from Brooklyn-based instrumentalist trio 4a Stables. With an ear and eye towards crafting soundtracks to characters and movies that haven’t been conceived of yet, Colin Ryan, Jeremy Benson, and Rob Lombardo bring years of experience playing together in various forms towards each conceptual movement. To celebrate the release of Bugboy, we had 4a Stables break it down for us track by track in their own words. Stream 4a Stables’ Bugboy and order your copy of the record here. This was one of the first songs we started working on as 4a Stables, and it probably went through dozens of iterations before landing where it did … a little Morricone-ish with a lot of dubby live mixing going on. It’s the start of a character-based theme that returns a couple more times throughout the album. Spells Cutty, as in Cutty Sark, a tasty but affordable “economy blend” scotch. We set up Colin’s drumset so each drum would trigger a different synthesizer, so every sound you hear is coming directly from a drum hit. It starts with the sound of the actual drums mixed out, so you hear only the synths at first, then the real drums blend in as the song builds. We switch instruments a lot. For this one, Jeremy ended up on bass, and Colin and Rob both played full drumsets. It’s got a funny rhythmic feel because we each thought the “1” of the rhythm was in a different place (in our group of friends we call this a “1-hole”) while recording, so the two drumset patterns compliment one another in an interesting way. We’re all huge fans of a TV writer named David Milch. And when we started making this album, his new show was the ill-fated “Luck.” There are references to it all over the album, lots of songs we wrote with certain characters in mind. The vision for this song was inspired by a beautiful horse-racing scene featuring a rookie jockey named Rosie. She’s Irish, and so the synth arrangement has some Celtic themes woven into it. Supposedly, this is the room temperature commonly found inside prisons. Seems on the colder side. This one starts with a recording of the steam radiator in Jeremy’s old apartment in Brooklyn. The song has no thermostat, just circus insanity. Bugboy We all feel this is kind of the centerpiece of the album. There’s so much going on in this song, from e-bowed banjos, to Colin’s maniacal singing, to screeching violins … all coming together for a very moody, tense feeling. It’s something of a character sketch inspired by the character Joey on the show “Luck” — a kind of well-intentioned-but-bumbling sad fool spiraling into and eventually out of a very dark psychic place. We wanted something driving, moved along by an unusual snare and bass groove and with a really long melody and chord progression that repeats. We wove in thumb pianos and finger cymbals to help layer up and punctuate the rthythm. Ever try to tune a thumb piano? Mon Gateau is the name of a racehorse. It means “my cake.” This song is in the key of butter knives played on roto-toms in like a 9/11 time signature. This one is a continuation of the melodic theme that started in “My Man Jerry” and culminates in “My Man Jerry Back.” The three are all loosely based on Jerry, a degenerate gambler character from “Luck,” whose ups and downs we follow in this trilogy of songs. Fun with wooden slit drums and a (probably unnecessarily) elaborate percussion arrangement that we actually had to write down. The vocal arrangement here is a twist on the “My Man Jerry” guitar melody. Jerry leaves, maybe goes to an ATM or digs around under his mattress, and comes back to the card game. Everybody’s happy — more money to win off of Jerry. The show was not Milch’s best work and was cancelled after one season. As with the cancellation, with this song we leave Jerry’s character in a pretty uncertain state.